Slow cooker meat can sometimes come out dry. In fact, that is one of the main reasons that people give for not cooking with their crockpots more often. I used to feel the same way. When I first started doing the freezer to crockpot meals, I was discouraged to find that a lot of the meals came out super tender, but dry as a bone. 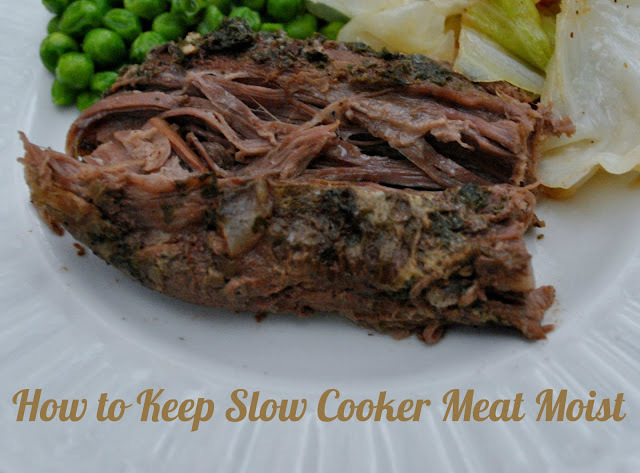 Fortunately, there are a few easy things you can do to make sure your slow cooker meat stays moist and delicious every time. One option to keep your meat moist in the slow cooker is to build a platform for it to sit up on within the crockpot. You can do this easily by making larger balls out of tinfoil and sticking them in the crockpot first and then resting the meat on top of them. You would think that the longer you cook meat in broth or juices the more tender it would get and this is true. Tender doesn't always equal moist though and keeping the meat out of the juices keeps the flavor in the meat and keeps the juices from sucking it all out. For just a few dollars, you can pick up a cooking thermometer. Even if a recipe calls for meat to be cooked on high for 4 hours or low for 6, every crockpot is different. It is best to check your meat when there is about an hour of your specified time left. You want the meat to be cooked through, but if the temperature gets past 175 degrees, it will start breaking apart the natural fibers of the meat, which creates the dryness. I usually pop my meat out of the slow cooker around 160-170 degrees, depending on what type of meat it is. I used to cook with all boneless skinless chicken breasts because I thought they were easier. The problem? They get dried out a lot quicker in a crockpot and their texture begins to change. The solution? Switching to wings, drumsticks or thighs. These cuts of meat are not only cheaper, but the skin and fat does not cause a big mess like you might think and the meat stays moist and delicious! A lot of recipes will give two cooking options for slow cooker meals, one for high temperature and one for low. If at all possible, cook on the lowest setting possible. You have less of a chance of drying the meat out quickly by overcooking it. When using a slow cooker, the heat that builds up and moisture inside is what makes it work correctly. If you are constantly lifting the lid, you are letting all that out. Lift it once or twice to stir, but refrain from lifting it more frequently if you want your meat to be moist. I rarely do this, but when I do it is usually with a roast or other large cut of meat. You can sear the outside in a hot skillet before putting it in the crockpot to help lock in the juices and give it a beautiful brown sear on the outside. Having trouble with dry slow cooker meat? Give a few of the tips above a try and I promise you will see a difference. I didn't know the tip about the platform. Great tips Kathleen. When I make a beef stew, I always sear the meat first. It makes a huge difference! Great tips! I'm definitely going to keep them in mind next time I'm cooking a pot roast! These are some wonderful tips! Thanks for sharing them. That looks good and I don't even eat meat (just chicken once in a blue moon, lol)! These are some great tips. I love the tin foil idea, would have never thought of doing that. Thanks for these tips. I'll admit, I don't use my crock pot near as often as I'd like because like you mentioned, the meat usually gets to dry for my liking. It's so hard to leave the lid on, have to peek. Great tips - looks delish! These are great tips! I am really trying to use my crock pot more these days and meat can definitely dry out quick. Sounds like the perfect dinner. Great tip about the platform. I'm gong to try that next time. Thanks Kathleen for the crock pot tips. I'm going to try chicken in my crock pot again. That was the only meat I had trouble with before. Beef or pork has always turned out great, but as I told you before, I didn't like the consistency of the chicken. Maybe I was leaving it in the pot for too long. Thanks again. I use my slow cooker once a week, so these tips are great. I really need to work on trying to sear the cuts of meat first! Great tips! Braising first really brings out the flavors and does keep it moist! We love roast in the crockpot and rest it on all the veg, yummy! I like the platform idea, but I really don't like to use aluminum foil. Any other suggestions to raise up the meat? I use veg like carrots and celery, or you can add halved onions to it. make a raft for your meat. Becky, anything that is oven safe can go in a crockpot. If you had a small metal or ceramic ramekin or other tray, that could be used on the bottom instead of aluminum foil.